Does that sound like my baking attempt got foiled? Well, yes and no. Yes, I baked the stuff in foil to retain the moisture and avoid burning. No, because it turned out perfect, totally foolproof! Especially after the last couple of baking disasters on my new oven, which I strongly suspect is overheating. Google says change the thermostat, dad says just recalibrate it, bf says replace the whole damn thing while it is under guarantee, bro says ‘you got duped again? Haha!’ I just decide to put up with the brat (the short-tempered oven, of course) until I get the thing checked. 20 degrees and 10 minutes minus what the original recipe suggests, and using protective layers wherever applicable – that’s been the strategy so far. So, for the recipe! Foil sheet for covering up! Marinate the fish in 1tsp lime juice and salt for about 10 mins. Lay out two layers of the foil sheet on the baking tray. Let it stand for 5 mins inside the oven before taking it out. Drizzle with lime juice (or balsamic vinegar) before you tuck in! 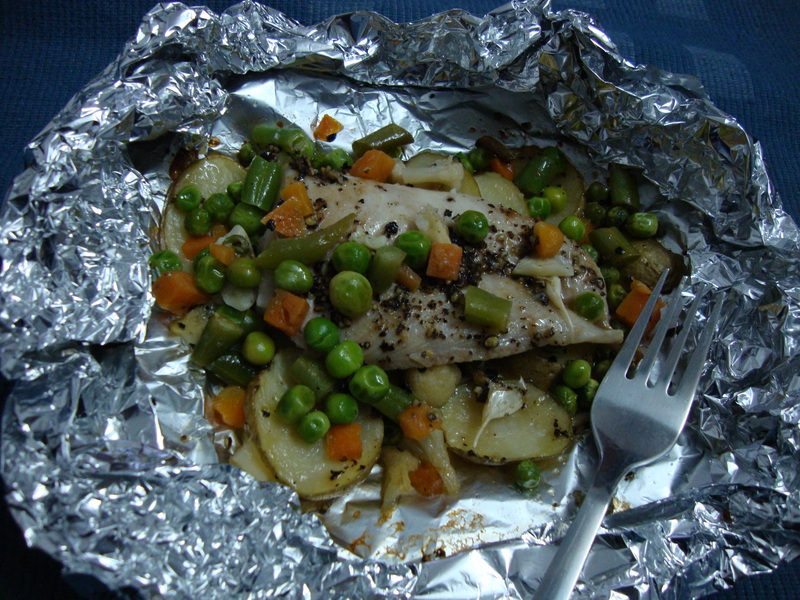 I wrap up the sides of the foil around the fish to make it into a bowl of foil and fit the entire thing into the plate. It looks kinda rustic and of course, one doesn’t waste the cooking juices. If you get bored of the flavours over time, try using a different kind of flavouring agent everytime. Rosemary, basil, lemon grass, orange or lemon zest, parsley, fresh coriander, chilly oil or anything you have on hand. Just try and use just one or two agents at a time to do justice to the poor dead fish. wow totally love this : quick easy and nutritious is totally my style of cooking ! thanks !! Do send me your email ? It seems you are also in Delhi ?